Robert St. Laurence and John Ambrosino in "Rent"
It may be hard to believe that the Pulitzer prize-winning musical "Rent" premiered on Broadway 15 years ago. A new production that opens the New Repertory Theatre’s season is a bit like a young teenager -- filled with energy and enthusiasm, a bit all over the place and awkward, even stiff at times, but with moments of real maturity and heart. A pop-rock take on Puccini’s opera "La Boheme," the musical’s bohemians are Mark and Roger, a filmmaker and a musician respectively, squatting in an industrial building on Manhattan’s Alphabet City during that last part of the last millennium. Mark’s former girlfriend is a performance artist who has left him for another woman, while Roger is falling for their upstairs neighbor, the comely heroin addict Mimi. A visit from old friend Tom Collins and the demure drag queen Angel, both HIV positive, mean that half the characters have the virus, so the pall of possible early death hangs over the proceedings. Add that the "villain" in the piece is the yuppie Benny, former roommate of Mark and Roger’s and now a wannabe technology/real estate mogul, and it’s surprising how well the musical holds up under the weight of these 1990s clichés. This is likely because the late composer/lyricist Jonathan Larson made themes of community and personal connections the heart of the show. 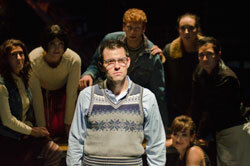 John Ambrosino and the cast of "Rent"
The New Rep’s production gets that part right. The cast clearly connects like members of a close, sometimes sparring family with a lot of true emotion shining through. Where the production trips up is on the details. Technical glitches, mostly with wildly imbalanced sound between the singers and the band and mik issues, detracted from some fine numbers (such as the nicely controlled frenzy of the opening title track); but even with perfect sound, others other numbers are problematic. The lyrical "Santa Fe" is just too static, a chance at some real choreography lost; the "Tango: Maureen" lacks the precision of movement that amps up the humor in the lyrics; while the rousing first act closer "La Vie Boheme" is too haphazardly staged, with so many things going on at once that the eye can’t focus on anything, resulting in losing the joy in the number as well as built-in moments of character development. At least the song features John Ambrosino as Mark, one of the show’s strongest performers. Ambrosino’s assured portrayal of the controlled Mark makes his go-for-broke vocals a sweet contrast to his character’s repressed disposition. And when he emotionally confronts the departing Roger in the second act, he’s thrilling. Robert St. Laurence as Roger nearly matches Ambrosino’s power in these later scenes, but he is too often relegated to a corner, crouching on his amp. Yes, Roger is a character that’s stuck emotionally, but also being stuck physically makes him a less impactful character, a real drawback since he is one of the leads. Also not quite balanced are Maurice Parent as Collins and Nick Sulfaro as Angel. Sulfaro has a sweet voice and nicely handles Angel’s declining health, but he’s just not, well, fabulous enough earlier on to fully convey Angel’s love of life. In what should be a showstopper, "Today 4 U," Sulfaro struggles with the demands of the music and the staging, and Angel’s effusive personality is lost. By contrast, Parent (who last stole scenes at New Rep in "Passing Strange") is spot on as the anarchist philosopher Collins. Vocally his rich voice purrs through "Santa Fe" and is joyful when declaring his love for Angel in "I’ll Cover You." He also shows range as an actor, from clowning around as an ersatz James Bond to expressing quiet dignity in the face of the second act’s sorrows. 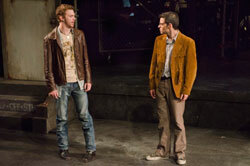 Nick Sulfaro and Maurice Parent in "Rent"
Other members of the cast make an impact. Ensemble members Cheryl Singleton (also from New Rep’s "Passing Strange") and Matthew Romero shine in the musical’s signature song "Seasons of Love," Grant MacDermott commands attention as both an Upper West Side father and a shady drug dealer; and Singleton is also particularly fine as a homeless lady, the one character to call the "bohemians" on their love of dramatic but ultimately impotent rebellion and self-imposed poverty. Her spat-out line -- "Let’s go. This lot of full of motherfucking artists. You got a dollar, artist? I didn’t think so" -- is a hoot. Normally portraying the wholesome girl next-door role as a New Rep regular, Aimee Doherty is cast as the foul-mouthed lesbian performance artist Maureen. Aimee (forgive me) milks all the humor she can out of "Over the Moon", the perfect suburban girl’s idea of what an edgy New York performance artist should be, right down to her perfectly absurd costume. Unfortunately this is about the only moment of costuming genius as Maureen’s girlfriend, Joanne (Robin Long), who is frequently described in the lyrics as sporting Doc Martens, is inexplicably an Ann Taylor wearing, lipstick lesbian. Even worse is that most of the homeless people seemed to have all recently received clean, new coats. In his director’s notes Benjamin Evett states that he’s trying to create a "Rent" that’s "rough, exciting, chaotic;" but the show he’s staged comes off as a bit messy. The big musical numbers suffer the most, although the one-on-one scenes are spot on. In the end, this production, as most 15-year olds, needs to gain a little maturity, but has its heart in the right place. 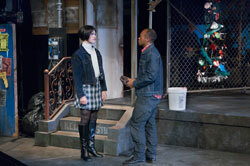 "Rent" continues through September 25, 2011 at the Arsenal Center for the Arts in Watertown. For more info you can go to the company’s website.